Today was rainy, windy, and cloudy, which was the perfect weather for hot soup! SGD’s original soft tofu soup comes with beef, pork, or chicken and mushrooms. I picked beef, and chose medium spiciness. All soft tofu meals are served with purple rice and banchan. Jjigae (찌개) is a Korean dish similar to a Western stew. There are many different varieties but it is typically made with meat, seafood or vegetables in a broth seasoned with gochujang, doenjang, ganjang or saeujeot. Jjigae is typically served in a communal dish and boiling hot. Sundubu jjigae (순두부찌개) or Soon Tofu is a hot and spicy jjigae (Korean stew) dish made with uncurdled dubu (tofu), seafood (oysters, mussels, clams and shrimp are common ingredients), vegetables, mushrooms, onion, scallions, and gochujang or gochu garu (chili powder) in Korean cuisine. The dish is assembled and cooked directly in the serving vessel, which is typically made of thick, robust porcelain, but can also be ground out of solid stone. 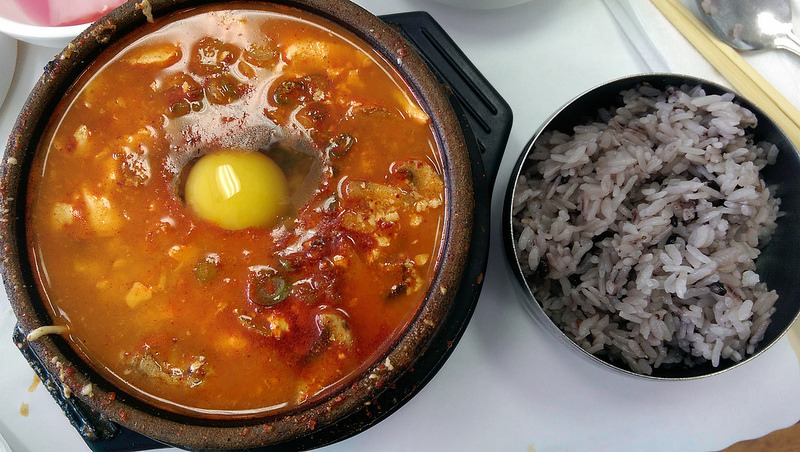 A raw egg is put in the jjigae just before serving, and the dish is delivered while still bubbling vigorously. This dish is eaten with a bowl of cooked white rice and several banchan (side dishes). Korean immigrants in Los Angeles originated Sundubu jjigae or Soon Tofu in 1990s. Hee Sook Lee, a first-generation Korean immigrant first arrived in Los Angeles with two of her three sons in 1989. She left behind her husband and 18-month-old son so that she and the other two sons, 5 and 7 at the time, could get an education. She decided to open a restaurant. To differentiate her eatery from the seemingly endless array of restaurants lining the streets of Koreatown, Hee Sook Lee decided she would serve just one simple tofu dish, soon-dubu — a common, cheap lunch dish with chunks of white tofu submerged in a bubbling bright-red soup saturated with spices. Hee Sook Lee took to the kitchen, spending long nights experimenting with different spices and condiments. From the commonplace stew, she conjured up 12 varieties with different types of meat and flavors. She brainstormed ways to customize the dish like a cup of coffee, offering four degrees of spiciness, with or without monosodium glutamate. After about a year of preparation and some advertising, Hee Sook Lee opened her first BCD Tofu House on Vermont Avenue in April 1996. It is the first Soon Tofu specialty restaurant. The name is short for Buk Chang Dong, a neighborhood in Seoul where her in-laws once ran a restaurant. Ten months after the first restaurant opened, Hee Sook Lee opened a second BCD Tofu House in Koreatown. Ten months after that, she opened a third in Garden Grove. Just two years into the business, Hee Sook Lee began to export her Soon Tofu to South Korea. Even at this rate, Hee Sook Lee hasn’t been able to open branches fast enough to keep up with the demand, and numerous imitators took advantage of the opportunity. Now Soon Tofu is hugely popular in Korea. Also According to Chef Roy Choi (of Kogi Korean BBQ fame), sundubu jjigae was a dish developed by Korean immigrants in Los Angeles. looking at this makes me crave for some more.. YUMMY!! I wish I could have this right now!